For more information, see the main lore article. Nords are the most common race encountered in Skyrim's cities, and can be encountered in nearly every aspect - among others, guards, merchants, bandits and Jarls. 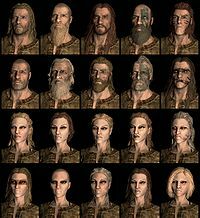 Stormcloaks encountered are comprised almost entirely of Nords, with the Nords sharing majority in the Imperial Legion as both officers and as soldiers. Citizens of Skyrim, they are a tall and fair-haired people. Strong and hardy, Nords are famous for their resistance to cold and their talent as warriors. They can use a Battlecry to make opponents flee. Be warned that this power treats everyone in range as a target, and is considered an attack, so you may want to avoid using it in situations where you have non-follower allies or in the presence of civilians. Despite its similarity to the Illusion Fear effect, it does not benefit from any Illusion perks. It also does not affect undead, Daedra, or machines. Fortify Warmth (FormID xx00088b): Your Nord blood improves your resistance to cold environments by 25 points. Nord skill bonuses lend toward a more combat-oriented style of play. With both one and two-handed weapons receiving boosts, players are able to choose their favorite weapon(s) with a bit more ease, and boosts to both light armor and blocking provides players both mobility and defense. The Nord Battle Cry power can be vital at earlier levels, causing enemies to flee long enough for the player to potentially recover. Nord NPCs who catch people stealing may say "By Ysmir, a thief!" Nord opponent "You're a disgrace to your own kind!" Non-Nord opponent "Skyrim belongs to the Nords!" Non-Human opponent "Your kind has no place here!" Bosmer opponent "Should have stayed in your precious forests, Elf!" Orc opponent "Die, you Orc filth!" Khajiit opponent "You'll make a fine rug, cat!" Argonian opponent "I'll use that tail as a belt!" Stormcloak fighting Imperials "Imperial dogs!" "A pox on the Empire!" Sighting a dragon "Talos save us! It's a dragon! Taking damage "By Ysmir, you'll pay for that!" Fighting in a snowy area "I'll paint the snow with your blood!" General "I'll mount your head on my wall!" "I'll water the ground with your blood!" "I love a good fight!" "Ha! I love a challenge!" "I'll carve you into pieces!" "By Ysmir, you won't leave here alive!" "You won't leave Skyrim alive!" This page was last modified on 20 April 2018, at 16:20.